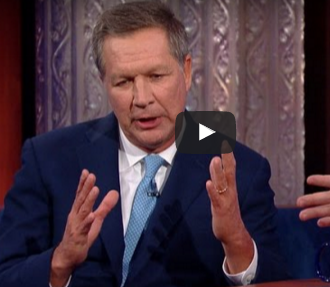 Ohio Governor John Kasich came to Stephen Colbert’s show a few days ago, and got absolutely eviscerated on his pro marijuana prohibition stance. Basically the governor trotted out the same old lies we’ve heard time and time again. And at one point barely remained coherent as he tried to weave a thought process about how some good could be considered good, and others bad. Well, here’s a news flash, marijuana, just like alcohol can be completely safe and even healthy if used in moderation. Drinking too much coffee can cause problems, that doesn’t mean it should be banned. Kasich may have been used to the softball questions he’s been lobbed at the debate, but Colbert really took him to town and didn’t let him loose. On top of that, we can now include another member to the “Did he smoke marijuana?” list, as Kasich has now publicly admitted to using marijuana . We can only imagine how his career path would’ve ended up had he been arrested for possession back when he was using it. Previous Next State to Legalize Marijuana?